We love this game! It is great for two or more players and fairly simple to pick up. This game is soooo fun! My husband loves Settlers of Catan, but we are getting a bit tired of it. This is a good (and less complicated) replacement. Great game! To trade or not to trade with other players... you want to make sure you keep other players happy so that in return they'll want to trade some beans to help you out too! 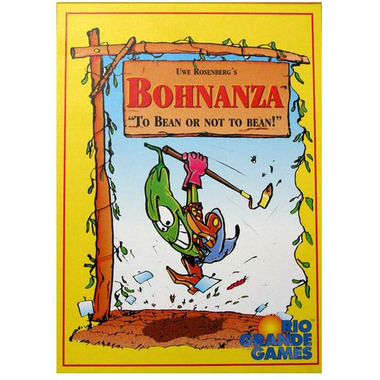 We've been playing this for a number of years...call it "the bean game". Everyone loves it! Bought this one as a gift for my daughter so she can have her own game at her house, too. We love the cartoons...and of course, I have a different "voice" for each bean...my kids think I've lost it! This is a fun, fairly quick game with surprising depth. Enjoyed by all in my group. This is one of my favourite games. It's simple to learn/teach and fun to play! Best game ever. Looked all over to find it. Great deal. Very glad we could find this on well.ca as we live in a remote place and well.ca ships to your door! Super fun game with minimal strategy required. Our friends introduced us to this game and we had to have our own. It's so much fun! I was so pleased to find it on Well.ca for much less than in the game store. So fun!! It's a great addition to any game collection - fun for both children and adults, a great family game. I bought this game after hearing some good reviews. It's a great game for children and adults alike. It's simple to learn but not so simple that adults would find it boring. Any fan of German boardgames will love this game! Ordering on Well.ca was simple and the game was delivered in only a few short days. My 12 yr. old son had played this game earlier with friends, and now really wanted his own. He loves it! Now we can all play it as a family - it's a really fun game. I found it on Well.ca and was very happy with the price and the prompt delivery! We were introduced to this game by some friends and we LOVED it, and we found Well.ca the best place to buy it. I would recommend this to anyone interested in a challenging game. Great game. Takes some time to learn all the rules, but fun for a large or small group. Great game! It's more fun when playing with more than 2 players. Awsome game. You will play it over and over again. Bohnanza is a fun game. I have played it many times. "I wan to play the bean game". You can also spend your points on getting an extra plot to grow beans.